Grace is given to us to announce God’s good news for men. God and the word of His grace can build us together. This is the building up of the Body of Christ now, the forerunner of New Jerusalem. God and the word of His grace also give us the inheritance. This is not “an inheritance” but “the inheritance,” unique, called “the eternal inheritance” in Hebrews 9:15. This also points to New Jerusalem. 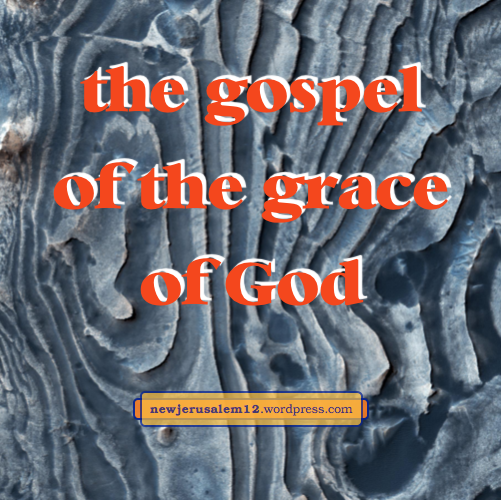 Similarly, Titus 3:7 ties grace to God’s eternal salvation, saying that “having been justified by His grace, we might become heirs according to the hope of eternal life.” Even more, 1 Peter 5:10 speaks of “the God of all grace, He who has called you into His eternal glory in Christ Jesus.” This eternal glory surely is New Jerusalem. In addition, the inheritance in Acts 20:32 is “among all those who have been sanc-tified,” a sanctification which prepares us for the holy city, New Jerusalem. This grace should operate in us to the extent it becomes visible. Barnabas was sent from Jerusalem to Antioch and “when he arrived and saw the grace of God, rejoiced” (Acts 11:23). Grace certainly will be very visible through New Jerusalem and will cause great rejoicing. The phrase “Glory to our God and Father forever and ever,” found in many New Testament books, points to the eternal New Jerusalem which has the glory of God. The prior post looked at Paul’s epistles and Revelation 1. First Peter twice ascribes both glory and might to God. In both portions Peter links present grace with eternal glory. Here Peter reminds us that every believer has been gifted. Each gift is a manifestation of the Spirit who regenerated us and is now operating within us. 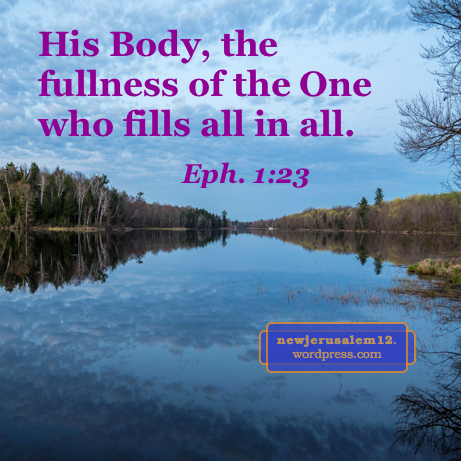 Based on this inner moving, we should minister the Spirit to one another for the building up of the Body of Christ. 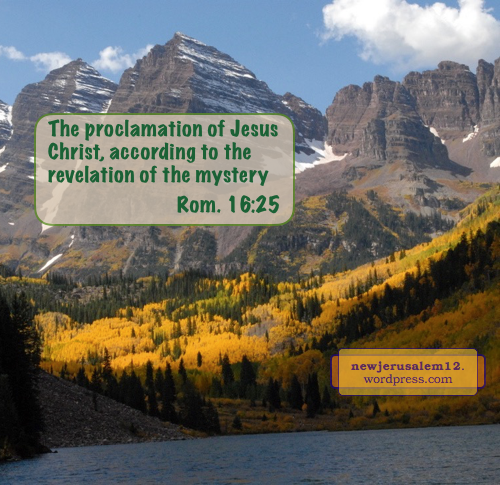 The Body, as the forerunner of New Jerusalem, is New Jerusalem’s precursor in glorifying God. First Peter 5:10-11: “The God of all grace, He who has called you into His eternal glory in Christ Jesus, after you have suffered a little while, will Himself perfect, establish, strengthen, and ground you. To Him be the glory and the might forever and ever. Amen. Here Peter tells us that the God of all grace has called us into His eternal glory; that is, He has called us into New Jerusalem. Now He is gracing us in our sufferings to perfect, establish, strengthen, and ground us that His glory may be displayed through us. 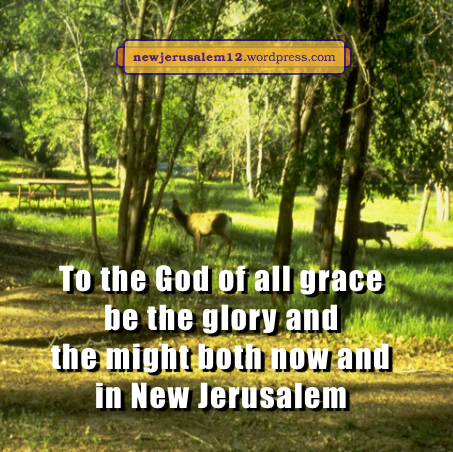 To the God of all grace be the glory and the might now and in New Jerusalem. Ephesians 4:16 also speaks about the functioning of every believer for building up. This is the era of the mysteries of God (1 Cor. 2:1), of the kingdom of God (Mark 4:11), of God’s will according to His good pleasure (Eph. 1:9), of Christ (Eph. 3:4), of the gospel (Eph. 6:19), and of godliness (1 Tim. 3:16). These are not separate mysteries but multiple facets of one mystery. The mystery will reach a conclusion (Rev. 10:7), and everything of God will, pleasure, and purpose will be manifested. Nevertheless, the contents of the mystery—God, Christ, the kingdom, God’s will, the gospel, and godliness—will continue eternally in New Jerusalem. How can we see and enter into this mystery? Revelation in spirit and grace are necessary. For our sake, the apostles received a revelation in spirit (Eph. 3:3, 5) and received grace to minister it to enlighten us (3:7-9). This is according to God’s eternal purpose (3:11) so it surely includes New Jerusalem. The mystery of God proclaimed in 1 Corinthians 2 was not according to human wisdom. To grasp God’s wisdom, our first key is “Things which eye has not seen and ear has not heard and which have not come up in man’s heart; things which God has prepared for those who love Him” (2:9). Natural senses (eye, ear, etc.) cannot touch the things God has hidden. Our need is to love Him. O God, we love You. Our second key is “We have received not the spirit of the world but the Spirit which is from God, that we may know the things which have been graciously given to us by God” (2:12). We have received the Spirit and, the things which God has prepared, “God has revealed them through the Spirit” (2:10). O God, grant me a spirit of revelation to see the things You have revealed by Your Spirit. To see more of New Jerusalem, which is mysterious to the natural man, we love God and receive the Spirit’s revelation. In Mark 4:11 the Lord Jesus spoke of “the mystery of the kingdom of God.” This mystery includes New Jerusalem, the ultimate stage of God’s kingdom. This mystery, even the existence of this mystery, was hidden in God before the Lord Jesus began to minister. The Lord said something about it in His parables. 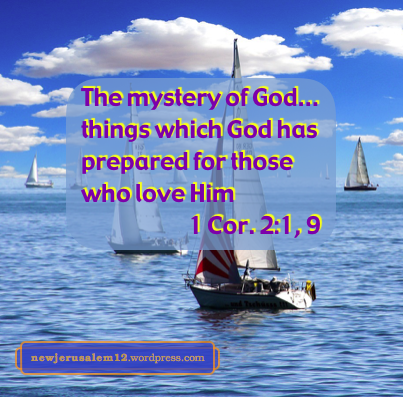 Paul spoke further, for example “I came to you, brothers,…announcing to you the mystery of God” (1 Cor. 2:1). Paul and his companions were “servants of Christ and stewards of the mysteries of God” (1 Cor. 4:1). And he asked for prayer “that utterance may be given to me in the opening of my mouth, to make known in boldness the mystery of the gospel” (Eph. 6:19). He was announcing the mystery because God predestinated the wisdom hidden in it “before the ages for our glory” (1 Cor. 2:7). Since the wisdom of the mystery is for our glory, it is for our glorification and participation in New Jerusalem. 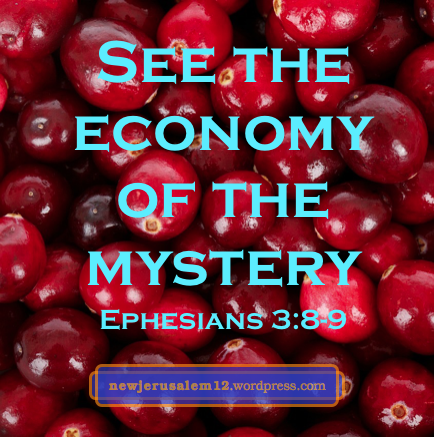 Today we are in the age of mystery and New Jerusalem surely is part of this mystery. But, “in the days of the voice of the seventh angel when he is about to trumpet, then the mystery of God is finished” (Rev. 10:7). “The seventh angel trumpeted; and there were loud voices in heaven, saying, The kingdom of the world has become the kingdom of our Lord and of His Christ, and He will reign forever and ever” (Rev. 11:15). This is from the second coming of Christ unto eternity, including New Jerusalem. Photo by Scott Mecum, courtesy of US Department of Agriculture. Christ as the wisdom of God (1 Corinthians 1:24, 30) is manifested through His believers, through the church, and eventually through New Jerusalem. 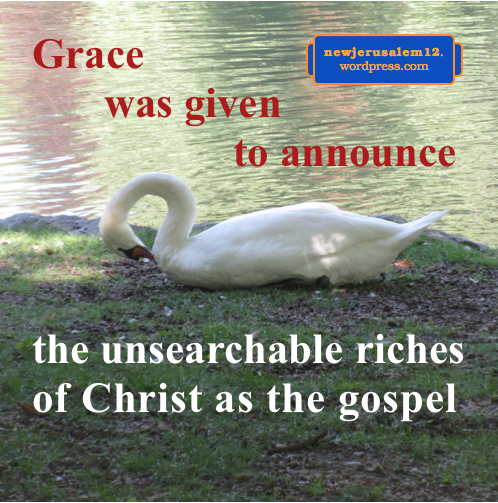 Here grace is given for announcing the unsearchable riches of Christ. As we receive this bountiful supply, we are enlightened to see God’s purpose, God’s economy, for both this age and eternity. The issue of our seeing is the manifesting of God’s multifarious/multi-faceted/manifold/all-various/infinite* wisdom through the church to subdue the negative powers in the universe. Eventually, all the negative powers will be in the lake of fire but God’s infinite wisdom will eternally be manifested through New Jerusalem. • and in Ephesians 3:11 God’s eternal purpose is in Christ Jesus our Lord. Apart from Him we have nothing and in Him we have everything. Today in the new man Christ is all and in all (Colossians 3:11). 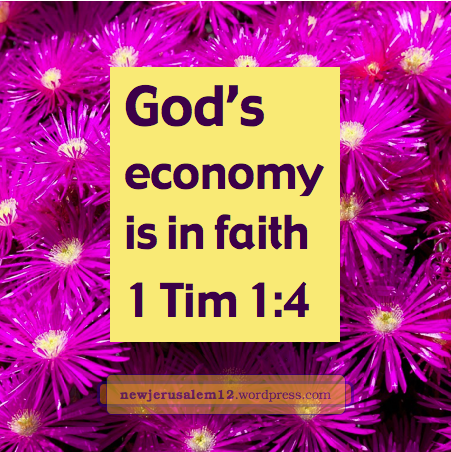 In eternity Christ will be all and in all in New Jerusalem. Springtime photo from space, courtesy of ESA and Flemish Institute for Technological Research.